Luka Modric saved Real Madrid from dropping two points at Granada with a superb strike from 30 metres. 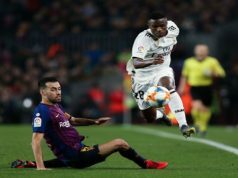 Los Blancos didn’t play a good game and could have even lost as the hosts were superior throughout the second half and had a goal disallowed when the score was 1-1. Granada started better on the game, with Adalberto Penaranda and Isaac Success hurting Daniel Carvajal and Marcelo in the sides. However, Los Blancos had the best chances of the first half. 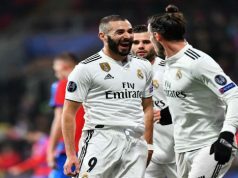 Benzema missed a good opportunity to open the score as he received a cross from Carvajal but his over-head kick was just wide. Cristiano Ronaldo had another super chance as he broke through on the Granada goal, but from a tight angle, he fired just wide of the post. The visitors finally made it 1-0 after 30 minutes. Carvajal found space down the right and crossed into Benzema, who turned the ball home from close range. 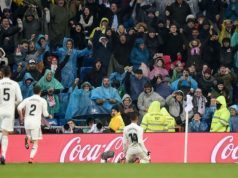 Granada could have levelled early in the second half as Barral leaped high to pummel a header towards goal, but Navas was there to make sure that it doesn’t enter the back of the net. Benzema miss a stunning opportunity in the next play as he received a pass from Modric inside the box. The Frenchman was clear on goal and applied the finish, but Fernandez incredibly managed to keep it out. Granada started to threaten Navas and they finally scored as El-Arabi sprinted down the right and latched onto a great cross from Rochina, sliding a finish under the body of Navas. Minutes later, El Arabi again had the ball in the back of the net as he met a Lomban header after a corner kick, but the goal was disallowed as he was in an offside position. It looked like Real Madrid were going to drop two points or even three, but Modric saved his team with five minutes to go. The Croatia international found some space outside the box and stroke a super shot into the top corner.